Note: this historical article refers to the discontinued ADC-100, ADC-212 and ADC-216 oscilloscopes. For new applications we recommend, depending on the precision required, the PicoScope 3000 Series 8-bit oscilloscopes, the PicoScope 4224/4424 12-bit oscilloscopes or the PicoScope 4262 16-bit oscilloscope. If an impulsive sound is generated in a room with reflecting boundaries, repeated reflections at the boundaries result in the rapid establishment of a more or less uniform sound field. This field then decays as the sound energy is absorbed by the bounding materials. The rate at which the sound energy decays is determined by the absorptive properties of the reflecting surfaces and the distances between them. The time taken for the sound intensity or the sound pressure level to decay by 60 dB is called the reverberation time RT. Values of RT may range from fractions of a second to a few seconds and depend upon the size of the room and the nature of the materials used in its construction. The reverberation time is a useful quantity for characterizing the acoustic properties of a room. A first step in architectural acoustic design is to identify appropriate values of reverberation time for the intended use of a room and then to specify materials to be used in the construction which will achieve the desired value of the RT. In the case of rooms with acoustic problems arising from excessive or inadequate reverberation, the measurement of RT is usually the first step in identifying a suitable remedy. In this experiment a method for measuring reverberation time is described. The method gives a rapid value for the result and if used in conjunction with a laptop computer can be easily portable. The experiment is well suited for actual field use and for use by technician and undergraduate students of acoustics, building, architecture and the built environment. 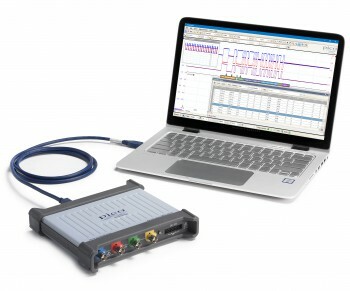 PC with PicoLog software and software for mathematical data analysis. The setup simply requires the connection of the microphone to one input channel of the ADC-100. The experimental procedure involves bursting an inflated balloon to generate the sound impulse. The ADC and the PC are then used to capture the microphone signals arising from the decaying sound field. The trigger level for data capture is set so that the data acquisition starts when the balloon is burst. Fast sampling is necessary to ensure that the signal reconstructed from the samples is an accurate representation of the analog input signal. The record length should be long enough to ensure that the decay event is fully captured. The settings in the experiments described here used the maximum sample rate available from the ADC-100 (which we measured at 22 kHz in channel A) and samples were taken for 0.5 seconds. Picolog rather than Picoscope was used in view of the large number of samples which are generated in the experiment. A representative set of results is shown in Figure 1. This figure shows the microphone voltage samples plotted as a function of time after the impulse. Time on the x-axis is measured in microseconds. In this case 10000 samples were captured. The reverberation time, by definition, is the time taken for the SPL to fall 60 dB. If the decay of the sound pressure is assumed to be exponential so that the SPL falls in a linear fashion, it is a simple matter to show that the slope of the graph of the SPL plotted as a function of time is just –60/RT. The measured quantity is the microphone voltage rather than the actual sound pressure but the proportionality between these two quantities implies that a 60 dB fall in microphone voltage corresponds to a 60 dB fall in SPL so that the reverberation time can be calculated from the voltage measurements. The procedure is to calculate the rms voltage Vrms and to find the slope of the graph of the logarithm of Vrmsplotted against time. In this case the slope of the graph is –3/RT. The calculation of the rms voltage involves squaring each sample, averaging over a suitable time interval and then finding the square root of the average. Calculation of the reverberation time then requires the calculation of the logarithm of each rms voltage and a regression analysis to find the slope of the graph of log Vrms against time. Clearly in view of the large number of samples it is impossible to process the data by hand. The procedure adopted here is to use Picolog to save the data as a text file and then to import the data into a suitable program with facilities for data analysis. MathCAD is particularly suitable for this although Excel could also be used. The output from a MathCAD document is shown in Figure 2. This shows the rms voltages computed within the document plotted on a logarithmic graph as functions of time and the regression line, also computed within the document, is superimposed. The averaging time is a variable parameter of the calculation. For the graph shown here an averaging time of 200 samples or 10 ms was used The reverberation time calculated from the slope of the regression line is 1.44 s.
The effect of changing the averaging time in the calculation process can readily be investigated and can be shown, within reason, to have little effect on the computed value of the reverberation time. More sophisticated measurements of reverberation time use a sound source of single frequency. These sources are used to establish a steady sound field and then they are rapidly switched off. The reverberation time is computed from measurements of the decaying sound pressures. The measurement procedure is exactly the same as that described here so that if a suitable sound source is available, frequency dependent measurements of reverberation time are possible using this procedure. A PC equipped with a sound card can easily be programmed to act as a suitable signal generator. Using a laptop computer the experiment can be made portable and reverberation times measured quickly in a variety of spaces. From the data gained the relationship between reverberation time and characteristics of the spaces may be investigated. You can download the MathCAD document used to process the results. This document uses the same data samples as shown above. MathCAD 2000 is necessary to see the process at work. Any comments or suggestions can be sent to Deryk McNeill at Institut Teknologi Brunei.